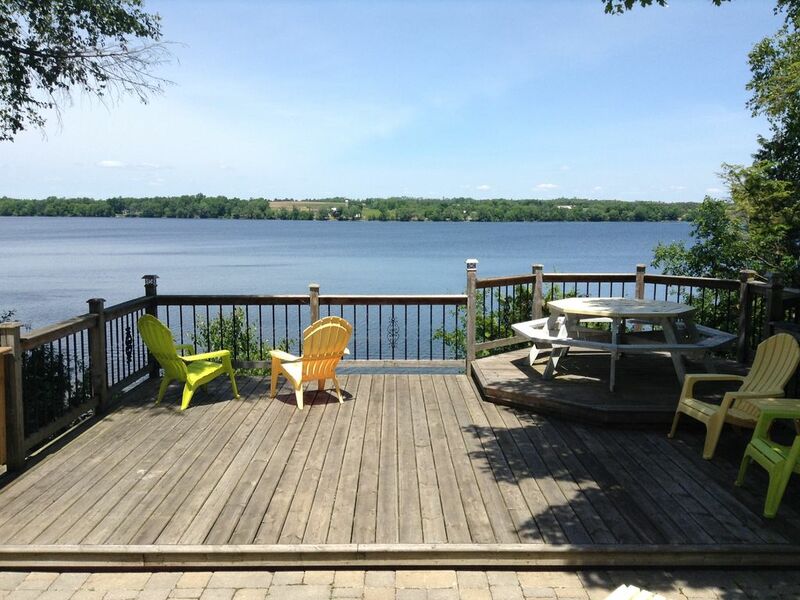 Now with free WI-FI.This property is located down a semi-private laneway on Lake Consecon. Tranquil and scenic with both woods and lake views. This cottage offers two decks, fire pit and a large dock for boats. TV with DVD, dishwasher, soaker tub, washer and dryer, linen for beds and bathroom towels provided. Sleeps 6 comfortably. Bright and friendly, this cozy cottage is perfect for a relaxing vacation any time of the year. For bicycle enthusiast , the County has popular routes and a shop for rentals or repairs. BBQ on deck and two kayaks , one canoe and paddles included. PFD are available and must be worn when using canoe and kayaks. A Provincial Parks Day Pass is included with the cottage. My husband and I purchased this cottage to use as a family getaway. It has served us well but our children have all started their own families and are busy throughout the summer. Now in retirement we also enjoy travel so find the cottage sits empty more than it is used. It is a lovely spot and we hope you enjoy it as much as we have. We love the private location and the view of the lake. It is nice to be able to relax but then if you want are only a short drive away from restaurants and shops. Lake Consecon is a quiet lake but also great for fishing and smaller boats. Low boat traffic in this land locked lake makes it feel almost private. We love to enjoy a glass of wine on the deck in the evening and watch the sunset. Rocky shoreline on peaceful Lake Consecon. Beautiful views. Warm for swimming (water shoes suggested). Great for fishing and small boats. Low boat traffic. Lake is landlocked. New gas fireplace has been installed in living room. Our group of five all agreed that the cottage was amazing......beautiful spot, excellent location and well stocked was an understatement. Helen was very helpful, responding to all questions almost immediately. We totally enjoyed the local wineries and art galleries. Two days wasn't long enough to really enjoy everything the area has to offer and the cottage view. Everything was just as advertised. The cottage is clean and well laid out with the bedrooms at the back and the living area looking out on the lake. The decks and outdoor property are great for family to gather and play games or take in the view. Penny was easy to get in touch with prior to our stay and everything ready and waiting for us when we arrived. We took advantage of the parks pass at nearby North Beach we were pleasantly surprised by the bottle of Sandbanks wine the that was waiting for us when we arrived. Thank you for sharing your amazing property with us Penny. Its a gem! Property was lovely with gorgeous sunset views! Penny made sure we had everything we could possibly need and more! Beautiful, well kept, rustic, well stocked, Amazing view. We thoroughly enjoyed our stay. Would book again. Would recommend without hesitation. The cottage was great! Penny was extremely accommodating with respect to check-in/out. The fishing was deceptively good off the dock. The location is great for hanging staying outside despite rain or overcast conditions. Such a great place that we decided to opt out of our wine tour in order to hang out at the cottage longer! Prince Edward County is a fresh young area with lots to offer. Our cottage is close to a number of Wineries, Harwood Estate Vineyards, Hillier Creek Estates and Stanners Vineyard are all within 5 km. Danforth and Closson Road are also an under 10 km drive and are peppered with wineries as well as Prince Edward County Lavender. Hinterland Winery (the only winery in The County to offer exclusively sparkling wine) located on Closson Road is in the process of opening a new brewery. The cottage has a rocky shoreline so if you are looking for some sand North Beach Provincial Park is only 10 km away. The Village of Consecon is also 10 km away with Cascades Pub and Grill located in an old mill, LCBO, library, park, and mini golf. 8 km away on the other side of Lake Consecon is Tanglewood Farm and Equestrian centre if you would like to go for a trail ride. Highway 33 / Loyalist Parkway is around the corner. You can catch the Taste, Arts or Barn Quilt Trail right into the Village of Wellington. This charming town has a variety of art studios as well as some of the best restaurants in Prince Edward County. At The Drake Devonshire Inn you can enjoy breakfast, lunch or dinner while taking in views of Lake Ontario and relaxing in the fun retro atmosphere. East and Main Bistro offer excellent high end fare that cannot be beat. If you are looking for a greasy spoon or pizza check out Maria's or The Duke of Wellington at the east end of town. On Saturday stop in at the farmers market held in the United Church parking lot. I never leave without at least one loaf from Humble Bread. YUM! You can continue on Highway 33 into the village of Bloomfield for some great shopping and more excellent dining opportunities. Or a few km more into Picton for sites including Sandbanks Provincial Park, Black Creek Cheese Factory, Claramount Spa or County Cider Company.